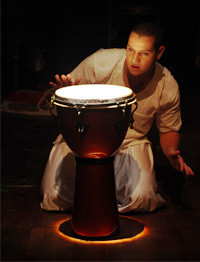 Musician and actor, the ogã Leandro Perez specialized as percussionist, works musicality and its interfaces in acting. Researcher of Brazilian traditional popular culture, specifically Afro-Brazilian, Leandro teaches percussion, capoeira and theater. For over ten years, he has been an ogã (Afro-Brazilian drum player) at Terreiro de Umbanda and Candomblé Tenda de Umbanda Caboclo Vira-Mundo e Caboclo Treme-Terra, in the north region of São Paulo. As an actor (clown), Leandro has a degree in Art-Theater by UNESP – São Paulo, and for this, he wrote the work Ogã-de-teatro: The traffic between artistic and religious practices (O ogã-de-teatro: O(s) trânsito(s) entre a prática artística e a religiosa). 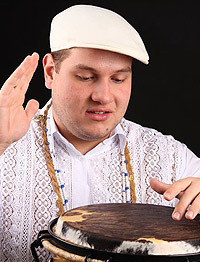 He studied the Malinkê percussion, originally from West Africa, developing also research focused on Brazilian traditional popular music, such as Candomblé, Umbanda, Bumba meu Boi, Jongo, Capoeira, Samba de Roda and Congadas. He participated in several research projects and scientific investigation involving percussion, capoeira, Afro-Brazilian dances and theatrical play. He integrates the group of studies and interdisciplinary investigations in theater, dance and music, Grupo Terreiro de Investigações Cênicas: Teatro, Ritual, Brincadeiras e Vadiagens. As an actor, clown, musician and musical director, he presents his work together with the theater and dance companies Nave Gris Cia. Cênica (contemporary black dance company), with whom he has worked since 2013 and the Desvelo Collective since 2014. He works as teacher in several projects, workshops and courses that involve the cultures of African matrices in Brazil.